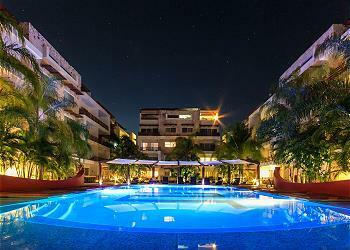 SABBIA CONDOS: INCREDIBLE NEW BOUTIQUE LIFE STYLE BUILDING TO ENJOY YOUR LITTLE PARADISE IN PLAYA DEL CARMEN, MEXICO. SABBIA CONDOS IS THE BEST CONDOMINIUM BUILDING IN TOWN AND THE RIVIERA MAYA. SABBIA CONDOS IS THE BEST CONDOMINIUM BUILDING IN TOWN ONLY A 5 MINUTES WALK FROM THE FAMOUS 5TH AVENIDA AND 15 MINUTES TO THE FERRY DOCK TO COZUMEL. This building offers a hugh and amazing pool with pool chairs and great common areas to enjoy the gardens. There is nothing like this building in the downtown area.You also can do your workout at the gym or play pool in the Games Zone. The building offer you underground parking área, for 2 or more cars. Uno de los mejores en los que me he quedado, en verdad que son super atentos, amables y la comunicación es muy buena, regresaré y me hospedaré de nuevo, adicional el apartamento es increíble y la ubicación inmejorable, gracias por recibirnos. The condo in Sabbia met all of my expectations. It was just as the photos showed beautiful two-bedroom fully equipped condo with two-and-a-half-bath. The property was absolutely gorgeous, the grounds were stunning, the pool was nice. I would have preferred for the jacuzzi to be a little hotter but all in all excellent stay. Tthe staff at Playa moments made sure to address all of our concerns right away. Having private garage access to park the car was very convenient and it was very close to shops restaurants and the main 5th Avenue. Will definitely stay again in our next visit to Playa the Carmen. Thank you to Rodger, Pascale, Ricardo and Angelo and the rest of the team for making sure our stay was perfect! Only been a day and already I'm dreaming of my next visit!! la semana anterior disfrutamos de ete departamento, el cual fue genial, los espacios son amplios, agradables y limpios. Las camas son muy cómodas y las sabanas y toallas estan en perfecto estado. el condominio esta en perfecto estado y es igual a las fotos, la piscina es lo maximo. Todo estuvo perfecto, el apartamento bello, la atención inmejorable. Mil gracias. Hola Daniel, muchas gracias por tu evaluación y comentarios. Nos complace saber que han podido disfrutar de sus vacaciones en este exclusivo condominio. Nuestro equipo mantiene altos estandares en todas las propiedades con el fin de lograr la completa satisfacción de cada uno de nuestros huespedes. Esperamos nos darán nuevamente la oportunidad de recibirlos aqui en playa del Carmen. Un cálido saludo del staff de Playa Moments! The whole apartment complex is in a great location. A lot of great restaurants less than 5m walk, 5th Ave less than 10m away and the beach also very close. Let me just clarify that my wife is a cleanliness freak so she wasn't too satisfied with the unit cleanliness, especially the floor tiles. (by my opinion the unit was clean, mayby not spotless but clean). I did contact the management because We could not open the safe despite using the instructions, also the master bathroom toilet wasn't working properly. (tank takes half a day to fill with water). Despite the minor issues I still give it 5* overall mostly based on the location and the amenities. Good afternoon Marcin, thak you so much for your evaluation and comments. Let me reply your comments since our staff works hard everyday to offer to all our guests a nice and perfectly cleaned unit prior the arrival; after the cleaning process our quality control supervisor inspect the apartment and verifying the cleanliness of the apartment, indeed they checked that the unit are completely ready to be assigned to the guest having all they might need to confortably enjhoy their stay. As you experienced pour attemptive concierge service take care of any detailes reported by sending our maintenance staff to solve the issue rapidly in time and manner. In Playa Moments we take advantage of guests' comments to improve our growth in order to offer an even better service to future guests. We hope we get the opportunity to receive you with us again soon. Warmr egards from Playa Moments' team! Our group (6 adults) enjoyed out stay. Plenty of room for all. The condo complex was well run and kept up. People respected the rules but the complex also made sure they were enforced (very politely). Erick, the playa moments rep, was very helpful, helping to arrange transport, providing dining recommendations, and fixing any probl m we had. The location was awesome. Close to everything but away from noise and crowds. I would definitely stay again. Hi Pamela, thank you for your evaluation & comments. In Playa Moments we take care of all details by providing our costumers the best amenities & service to make them feel confortable as at home. We hope we get the opportunity to host you again soon. Kind regards from Playa Moment's team. The place is very nice... service was great and the pool are perfect to spend some time there. Very confortable and clean. Hi Sofia, thank you for your evaluation & comment it was a pleasure to have you with us, we are always happy to take care of our guests providing them the best amenities, services & locations. We hope we get the opportunity to welcome you back soon, kind regards from the Playa Moments team! Amazing and comfortable space, it felt better than Home, many restaurants and bars within walking distance, Nancy was always available to help us. Hi Elia, it was a pleasure to have you with us, thank you so much for all your positive feedback, we certainly hope we get the opportunity to welcome you back soon. Kindness regards from the Playa Moments team! El departamento muy bonito, tal cual como las fotos, el servicio y amabilidad de Nancy de primera. El Departamento muy bien, estuvimos contentos y cómodos, también el servicio proporcionado por Victor fue muy bueno, siempre muy amable y atento. Solo consideramos que la propiedad ya tiene algunos detalles de mantenimiento que deben ser atendidos a la brevedad. Todo el proceso, desde antes de mi llegada hasta el check out, fue muy claro y prolijo. Excelente ubicación, tranquilo y confortable. La atención fue muy buena, siempre atentos a cualquier consulta.